Our Products: Salesforce Application | Recurring App | Scideas Solutions Pvt. Ltd. The Recurring app is a Salesforce solution to perform creation of recurring means repetitive records efficiently. 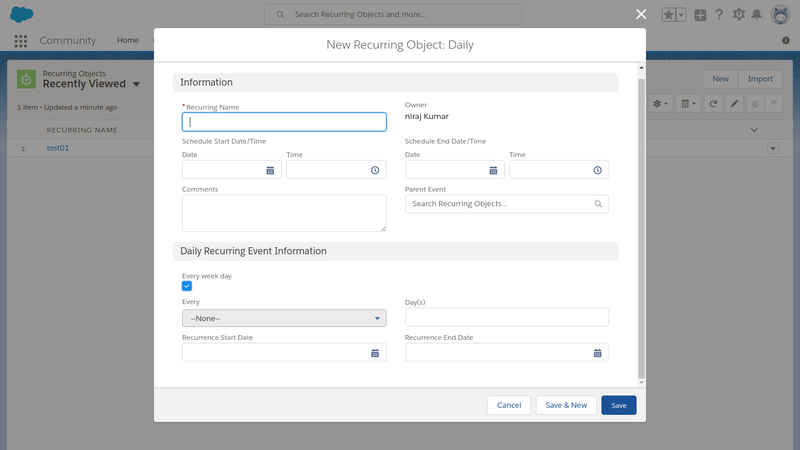 By default, Salesforce provides recurring functionality only to the activity object out of the box. But our product is a great extension to this, it provides functionality to create recurring records to any standard object as well as custom objects. For the creation of recurring records, one has to do a very complex calculation on date and time to create and store records. For those type of requirement, Our app comes as a savior. First of all, it reduces development time which was involved during the process of creating and storing multiple and repetitive records. Along with that, it gives the flexibility to add records on user’s convenience and their suitable particular time interval. 1. Daily with days interval options. 2. Weekly with week interval options. Along with the above listed tasks, there is a huge scope for further customization as well according to particular business process.